The imperial capital Huè was part of the 1968 Tet Offensive, a series of surprise attacks launched by the Viet Cong and North Vietnamese troops on cities and hamlets throughout South Vietnam. 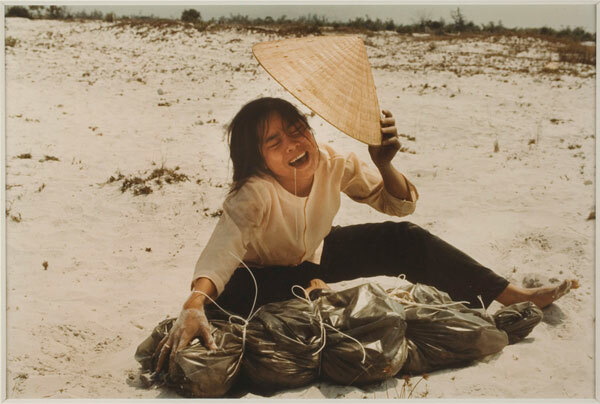 Here, a woman returns to her razed home in April 1969 finding the bagged remains of her husband, one of forty-seven recovered from a mass grave. The terrible emotive power of the widow’s wailing is coupled with Burrows’ ability to capture perfect compositional triangulation, a technique reminiscent of Renaissance pietà paintings and sculpture.